The American Fly Fishing Trade Association has announced that Matt Smythe will join their team as communications director. 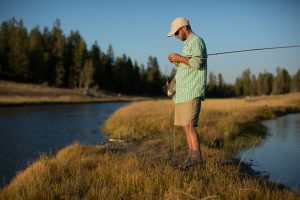 Bozeman, Montana: The American Fly Fishing Trade Association is pleased to announce that Matt Smythe has been hired as communications director. A freelance writer since 2011, Smythe has worked in advertising since 2004 holding positions from business development to creative direction on brands like General Motors, Blue Cross Blue Shield, Thomas & Thomas, and ScentBlocker. He’s also a filmmaker and published writer with stories and poetry appearing in Fly Fish Journal, The Drake, Midcurrent, Boating Magazine, Southern Culture on the Fly, Post Magazine, and others. An Army veteran and native of the Finger Lakes region in Western New York where he lives with his wife and three kids, Smythe is an avid outdoorsman who grew up fishing, bowhunting, and camping, learning how to fly fish during grad school—a passion that made a profound impact on both his personal and professional life. Coupled with his professional background in marketing communications at the national level, his experience will be a huge asset to AFFTA and its membership.